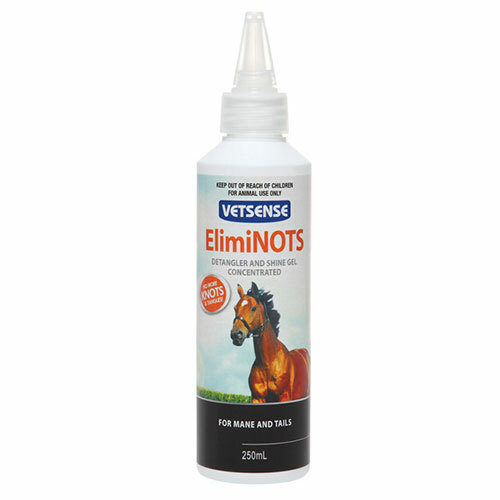 Vetsense Eliminots Detangler And Shine Gel For Horses. Vetsense ElimiNots Detangler And Shine Gel is lavender scented exceptional detangler as the name suggests and also gives a silky shiny finish to your horse’s manes and tail. It can be applied after bathing your horse with Vetsense EquiGloss 2 in 1 shampoo and conditioner. You can also spray EquiGloss 5 in 1 spray after you have applied this ElimiNots detangler. The shine gel comes with a concentrated formula that doesn’t contain water or alcohol. It contains silk protein, lavender oil & Vitamin E conditions the coat and leaves good odour. It leaves a pleasant fragrance that is loved by horses. Take small quantity like 20 cent piece in your hands or put directly onto the target area and massage with your hands. Can be used on dry or wet hair. If furs are heavily tangled then apply and massage more until the fur becomes untangled. Good fragrance and deodorizes the coat. Avoid contact with eyes, nose and mouth.